Choosing a Fuel: Oilheat or Natural Gas? Many New Yorkers have a choice of whether to heat by oil or natural gas. Boro Energy sells both fuels, but in our view, Oilheat is the better option for most customers. The Consumer Energy Council of America recommends that consumers upgrade their heating oil systems rather than switch fuels, and we agree. However, if you're determined to convert, we are more than willing to help. To get started, please visit our Oil-to-Gas Conversions page. For those of you who are still undecided, here is how Oilheat and natural gas compare on a few crucial variables. Emergency Service and Preventive Maintenance: As an Boro Energy customer, you can choose the fuel you prefer without sacrificing on service, because we provide a full range of services for both residential and commercial customers, including 24-hour emergency coverage for both types of systems. 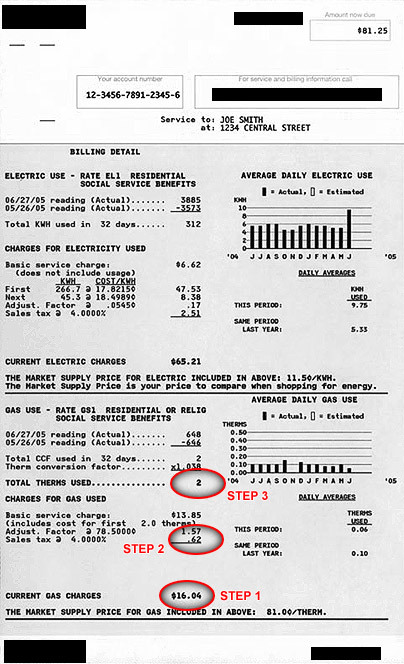 Price: In 12 of the 17 years from 1992 to 2008, the average annual price of Oilheat in New York State was lower than the annual average price of utility gas, according to the U.S. Energy Information Administration. Environmental Impact: Both fuels burn cleanly with minimal adverse effects on the environment. In fact, studies have found that in many cases, biofuels like Bioheat® heating oil actually burn cleaner than natural gas. Equipment Costs: New heating equipment for Oilheat and natural gas are priced comparably. Upgrading to new equipment without switching fuels is less expensive than undertaking a fuel conversion. Boro Energy offers both upgrades and conversions. Oilheat is the best choice for safety, and it has a great track record on value. If you are curious how costs compare for Oilheat and natural gas, this online calculator can help. Please follow the instructions below to compare prices, including the additional charges that utilities levy on their customers. 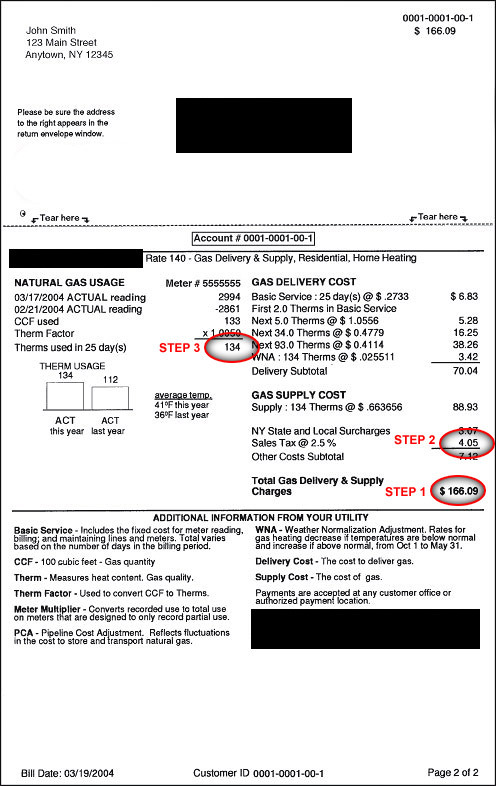 We've included two sample gas bills below (click on each one to view an enlarged version). You'll see that we've circled the locations where you'll get the information you need for each step. Please enter your total gas charges (includes delivery and service charges) into the box below. These extra charges are included in your cost per therm calculation below. Please fill in the above field to complete the calculation! Please enter your sales tax in the box below. We're going to subtract this from your total gas price. We're then going to divide the subtotal (the calculated amount above) by the number of therms you've used, to arrive at the price you've paid for each therm. Finally, we'll take this new subtotal from above and multiply it by 1.38. That magic number will convert your cost-per-therm to the cost-per-gallon. Just click Calculate!